Toothaches are notorious for causing dull, aching pain or excruciatingly sharp sensations that leave us frozen in our tracks. Depending on the underlying cause, the symptoms can vary. Swelling and Bleeding — Issues such as gum disease or tooth abscesses can cause both the teeth and the gums to hurt, because of the swelling and infection involved. If a warm salt water rinse and flossing doesn’t help the soreness to go away, there is likely a deeper infection down under the gums that requires a professional’s care. Your dentist may need to perform a root canal or recommend a deep cleaning and ongoing periodontal treatment. Pain When Biting Down — Teeth that are cracked or have a failing/aged restoration (such as a crown or filling) may hurt when you bite down on them. But avoiding chewing on that tooth isn’t a logical solution for something that will only continue to get worse. See a dentist to have him or her pinpoint the exact area that the pain is coming from, so that a repair can be planned out. Sensitivity to Hot Foods — When a tooth responds poorly to hot foods and drinks, it’s usually because something is wrong with the nerve. It may be that the tooth is dying, has an abscess, or there is an undiagnosed crack. On the other hand, cold sensitivity is fairly common and not something that is usually a cause for alarm. But pain when exposed to heat warrants a same-day call to the dentist’s office. Sensitivity to Sweet Foods — Anything from your artificially sweetened coffee creamer to that piece of birthday cake you had in the office can cause a “zing” if you have an active cavity. But fair warning: not all cavities hurt or are sensitive to sweets! Pain When Flossing — Soreness when you floss can be caused by anything from mild gingivitis or food caught between the teeth to advanced gum disease. If symptoms don’t improve after 10-14 days of daily flossing, see a dental professional. Throbbing Pressure in the Top Teeth — Do you tend to suffer from allergies or sinus infections? The pressure of your nasal sinuses can push directly against the nerves and roots of your upper teeth, causing referred dental pain. It feels just like a regular toothache, but there’s nothing wrong with your teeth! Wisdom Teeth — Impacted or partially erupted wisdom teeth can cause generalized pain in the jaw, along with swelling or infection. If they are coming in at an angle, the pressure may be pushing against other teeth as well, causing additional pain. For most people, wisdom tooth pain tends to be a “come and go” process. 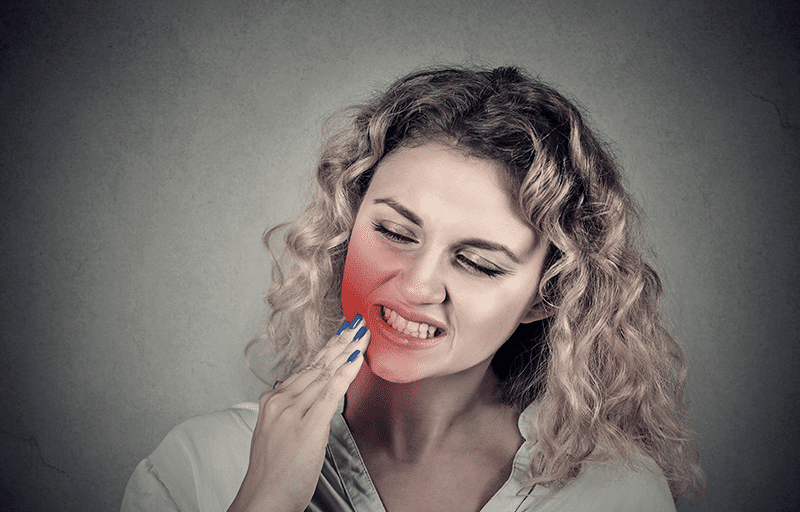 If you suspect that your toothache isn’t from something that requires immediate attention, most dentists will recommend taking an over the counter anti-inflammatory like ibuprofen. You can also rinse with warm salt water to reduce swelling or apply a cold compress to the side of your mouth. Do not rest aspirin against the side of your tooth, as it can cause a chemical burn. Severe tooth pain or issues that don’t resolve within a day or so (such as sore gums due to trauma or food getting caught unexpectedly) will need to be examined by your dentist. The type of toothache treatment your dentist recommends will vary, depending on what is observed during your exam and visible on the X-ray. You may only need a cleaning to remove tartar under the gums, a small filling to repair an area of decay, a crown to protect a cracked tooth, or even a root canal due to an active abscess. It’s impossible to diagnose the pain over the phone, so scheduling a dental appointment is the only way to get a sure-fire answer about your toothache. Are you avoiding that call to the dentist because you don’t have insurance? You can still save 15-50% off of routine treatments and emergency appointments with a discount dental plan like the ones available from Aetna Dental Offers. Talk to a dental savings expert today for a free quote.